When you are on the road like this, you are alone. You are with dozens of people each day, and most of them are friendly and many become your friends. But you spend your most precious hours alone. You live with this because it is your doing. You could stop any time and lead a normal life but you don't. It is routine for you, this cycle of meeting people, creating a cosmetic bond and leaving them. You don't mind because you are so busy working you just don't think about it, until you meet her. You are struck by her beauty before you even hear her name, and for the next few hours, you watch her walk into your life. Helplessly, you let her dance through your feelings, touch your spirit and caress your soul. She has a way of looking at you as if you meant something to her. She has a way of talking to you as if you were her closest friend, of touching you as if you were King. She has a way. She is all that nature can offer; she is a flower blossoming, the Sun rising. She is more to you than any women you've met in half a decade and you would easily trade half a decade of your life to be with her. She is everything you love and you know you could love her, and you remember the last time a story of such great love was told, the damn ship sank and he - you - died a frozen death. And then you hold her and say goodbye and you get on your motorcycle, pull on the throttle and you ride right out of her life, because you want to, because you can't believe it would really work and because this is your doing. Only 146 days to go! 300 million people will watch the ball drop in Times Square this December, and only you will know how it is done! Mark gives you a backstage view of the most famous orb on this great orb. Catch the view from where the ball sits, including an imposing clock tower, and the miracle of Times Square! Saw this crew while wandering through Central Park. 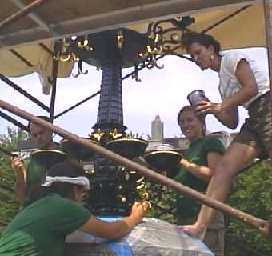 (L-R) Michael McQuillen, Lisa Barro, Kim Owens and Vallessa Monk apply gold leaf to finish up renovations on the Cherry Hill fountain. Built as a horse trough in the 1880's, the fountain was in disrepair for decades before the Central Park Conservancy restored it. Monk works for the Conservatory and McQuillen, Barro and Owens are summer interns. What's Mark doing in the Big Apple when he's not scaling skyscrapers? He's hanging out beside the Ed Sullivan Theater, watching people in America's favorite pastime; autograph lunging. It was late Saturday afternoon. I had been in the library at Rutger's University - a nice school, in a nice part of town, I thought. When I came out the front door, I could see the poor thing on its side. I walked over and just stared for a while. I was pretty helpless. Somebody had knocked Bob over (accidently, I trust) while pulling out of a nearby space, and (accidently, I trust) forgot to leave a note to tell me how sorry they were. I wondered if it was the same person who, days before in a New York City parking garage twisted my throttle cables to near submission and who (accidently) forgot to leave a note. A couple of guys helped me pick Bob up, and he actually suffered little damage, thanks to sturdy crash rails. I have massaged the throttle cables to work fairly well now, but this has reminded me of my vulnerability on this project. It has been called the ultimate team sport. It has been called the fastest human-powered race on the water. It will move you. Ahillia Harnandan shows her colors at the oldest flag company in the United States. All is not evil out here though. Like the day I was in another library and I thought someone had stolen the modem card from my computer. 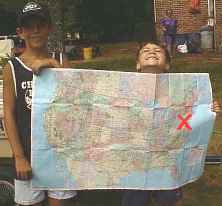 I even bought a new one (for $100) before I found it, in an unusual place with too long a story to bore you with here. Notes: I have enlightened myself with the truth that this trip is very much in my own hands, that along with the complete freedom I have, comes a precarious path I will take. I know that I can write good articles and I can write bad ones and no one will approve or disapprove before they go to you, the readers. I know that I can ignore the press and they will not approach me to promote this project. I can forget trying to get sponsors and they will forget me. I never have a "back seat driver" and everything I do is on my own. If I choose to ride my motorcycle in the rain, no one will tell me not to. If I don't see a van slowing down in front of me, no one will squeeze my brake handle for me, and when I decide to brake instead of swerve, no one will say "bad idea, Mark." So when I smack old Bob into the back of a minivan, there is no one else to blame but me and there is no one else to pick up the pieces. It only took a second for this to occur to me and it was a few seconds too late. Thankfully, nobody was hurt in this little fender-bender. Making good fortune, cookies, in Philly. "Read this and prosper." "A new romance is in your stars." "Good fortune will come your way." "You are about to be enlightened." # 24. All Ears on Deck!! They call him Inspector General and for ten years he's been a part of the team making the finest motorcycle in the world, the Harley Davidson. 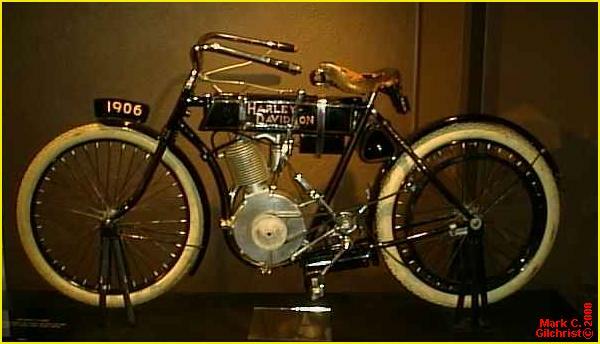 See a 1906 Hog - who says Harley made only two-cylinder bikes? Thanks to Laugerman's Harley-Davidson in York, Pennsylvania. They are a true family outfit, with Julia, Heather, Dave, Mike, Denise, Delores, Donna and Sandy (Keller) all Laugermans and all carrying on the family tradition started by Lloyd Laugerman in 1949. This is one of the best Harley dealerships I have been to, and I'm not just saying that because they went so much out of their way to help me, I'm saying it because I spent hours there, watching their customers and staff and have not seen anything so exceptional in a long, long time. Notes: Every day I pass by at least 1,000 working telephones, yet none are any good to me. I cannot plug my modem into a pay phone, and asking someone to let me plug my computer into their phone is like asking for their car keys. Hotels are out of the question. No, I am not on the dark side of the moon and I am not at the bottom of the ocean, but I may as well be. But there is good news! I have recently acquired technology which may allow me to access a phone line daily. This will greatly improve the speed with which I update the web site and respond to your emails. Over seventy years ago, Bodie Turner worked the C & O Canal and he is one of the last mule skinners alive to tell about it. 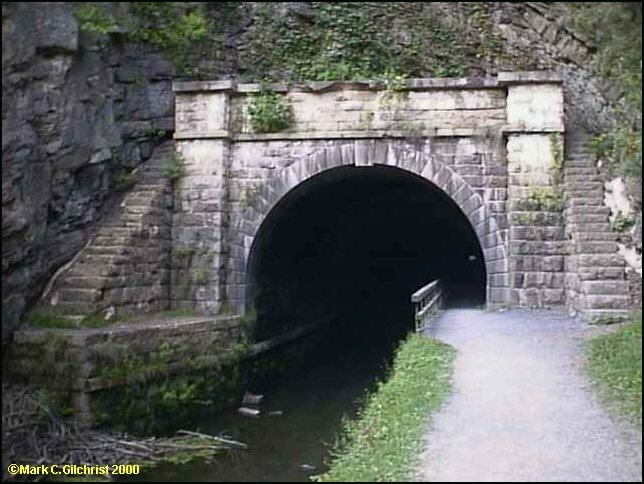 One of our country's most interesting National Parks, the C & O Canal was destined to fail before it opened. Ride the canal, like it's 1899. Netscape users: I have made a major breakthrough in making the site look better on Netscape (I hope you've noticed!) Please let me know where things look a little odd or can be improved. Regarding the piece on the Harley Davidson worker in York, Pennsylvania. (52 Minutes of Pure ATTITUDE) If you think the article is biased, you might be right. No, Harley is not a sponsor of this project, so I did not write the article for them, and it is very doubtful they will ever be a sponsor, so I am not buttering them up. If the article is biased, it is because I own a 1997 Harley Davidson FLHP and am relying upon it for this trip, and in the three months and over six thousand miles we have been together I have been very impressed with the quality of this motorcycle. A complete index of all 126 articles is available from the main page. This is a handy way to find an article you once read, but can't remember the title of, and is also a nice way to browse the articles. Items listed in Mark's Trail are not indexed. the True America Flowers photo album.